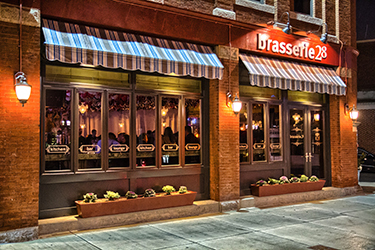 A contemporary European-style restaurant and lounge located in historic downtown Andover, Brasserie 28 sets itself apart from most neighborhood restaurants with a stylish yet comfortable vibe and a menu of fresh, local an innovative cuisine. Split into three sections - a bar, lounge and restaurant - Brasserie 28 has the ideal spot for any kind of outing from drinks with friends to an intimate dinner for two. To complement the frequently-changing menu, the restaurant serves an array of seasonal cocktails and microbrews as well as 35 wines by the glass & 67 by the bottle. Wines by the glass are poured by the state-of-the art Napa technology wine system that allows each glass of wine to be the freshest every pour.